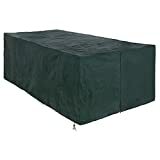 – This PE furniture set cover is only intended to be used for covering your furniture in bad weather. – It is recommended to take off the furniture cover and expose your furniture to sunshine on sunny days. – This cover set will deteriorate in extremely unfavorable weather such as heavy rain, snow and 48 degrees heat.